Pass the mouse across to enlarge. 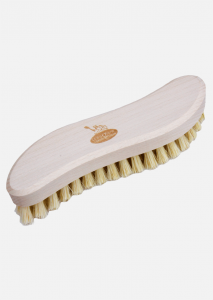 The traditional semi-stiff brush for fabrics is used for clothes but also for carpets, rugs, etc. Its ergonomic S-shaped form makes it very convenient to hold. Almost unbreakable and long-lasting. Brush made of sisal plant fibres and beechwood certified FSC®: wood comes from responsibly and sustainably managed forests.